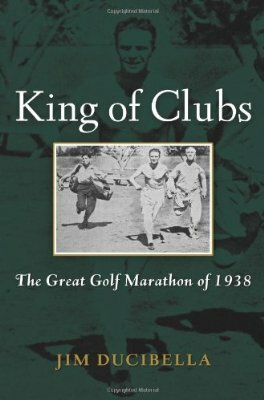 Reprinted from King of Clubs: The Great Golf Marathon of 1938 by Jim Ducibella. Used with permission. Copyright © 2012 Jim Ducibella. J. Smith Ferebee was born and raised in what today is an affluent section of Virginia Beach, Va., known as Broad Bay. While living in Chicago, he gained a reputation for doing anything on a dare—including once swimming for 30 minutes with his hands and feet tied behind his back. In 1937, he and Chicago friend Fred Tuerk bought 296 acres of land adjacent to what had been the family home in Virginia. An offer soon came to purchase the land, which sent Ferebee and Tuerk into a disagreement that threatened their friendship. When a business trip to Milwaukee fell through, Ferebee invited Tuerk to Olympia Fields Country Club in an attempt to repair the rift. While there, Ferebee played 90 holes from dawn to mid-afternoon, leading Tuerk to propose a wager he thought would end their impasse. Instead, it turned out to be a prelude to the most extraordinary bet in golf history—a story that captivated America for the rest of the summer of '38. As some of the crowd around Ferebee’s locker at Olympia Fields moved off, Tuerk inched closer and heard Ferebee talking about that day’s scores. As usual, they’d been in the mid-80s. Ferebee joked that he’d never be club champion, unless the winner was the guy who played the most holes. Tuerk rolled his eyes. “I’ve thought about this for a while,” Ferebee began, slowly pulling on his trousers in what Tuerk interpreted as an obvious effort at building suspense. That clinched it for Tuerk. It was time to call Ferebee’s bluff. No one, he reasoned, could play 144 holes in one day. Tuerk reinforced that conviction loudly by offering Ferebee a one hundred dollar bet. Tuerk was pretty sure he knew where Ferebee was steering the conversation—to their property in Virginia—and he happily went along. This disagreement between them could be broken in his favor, but only by outwitting Ferebee. Tuerk negotiated firmly. Ferebee would walk every step of the 144 holes, and every step between holes. He would tee the ball himself at the start of every hole. Any 18-hole score higher than 95 and the match belonged to Tuerk. Once he started, Ferebee had to finish all 144 holes by midnight. There would be no rainchecks. Witnesses had no idea what they were talking about, but that didn’t stop them from jumping into the fray. By the time Ferebee finished combing his hair and straightening his tie, he had taken on another $2,500 in bets. Tuerk wanted the matter settled the next day. Ferebee suddenly froze: he had never told his wife of his change in plans. For all Angeline knew, he was in Milwaukee on business. Even after nine years of marriage during which he had collected on a slew of crazy bets—“hooey angles,” as his wife, Angeline, called them—Ferebee knew she would be adamantly opposed to risking the precious Virginia property over a triviality like golf. No, he implored Tuerk, this must be handled discreetly. Angeline was starting a vacation in Virginia on August 4. He would see Tuerk at Olympia Fields on August 5. King of Clubs won 2012 book of the year from the International Network of Golf. Yes or No: Is the Players the Fifth Major?